Wireless technologies are integrated into almost every part of our daily lives. 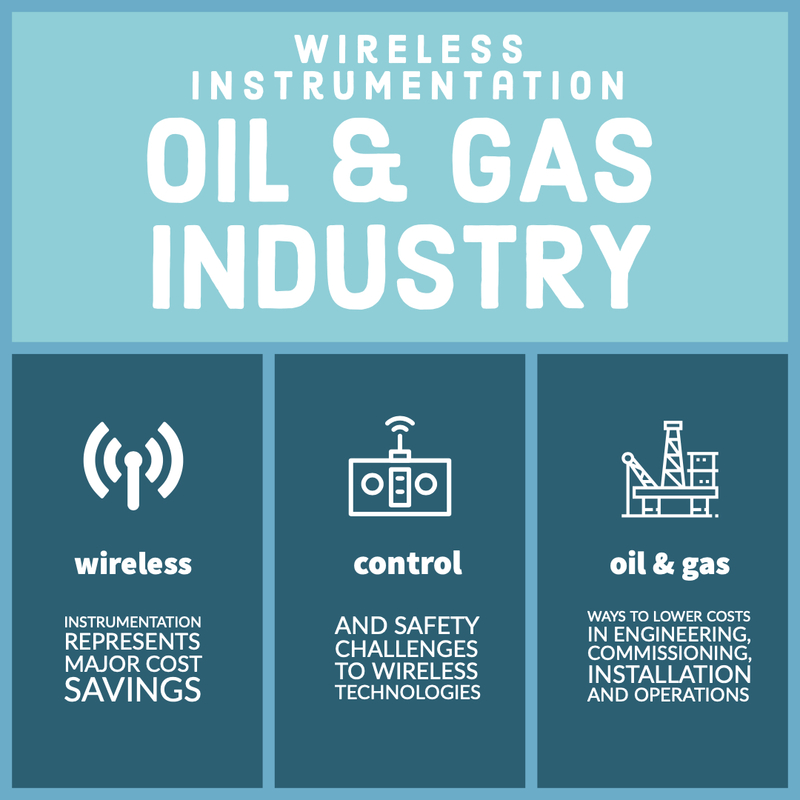 Wireless technologies for Instrumentation offers significant cost savings such as faster commissioning, efficient maintenance when compared to traditional wired networks. The value of this cost savings are particularly significant in the highly competitive Oil and Gas industry, where aging facilities are common and upgrades are expensive. There are still some uncertainties on Wireless technologies in the industry due to its unknown performance characteristics such as stability and reliability of wireless communications at offshore and onshore facilities. Due to this, the acceptance of wireless instrumentation in the oil and gas industry has been slow even though the first wireless sensors are available since 2007. Reliability of wireless Instrumentation is critical as automation systems rely on accurate information for operators to make informed decisions for control and safe operations. 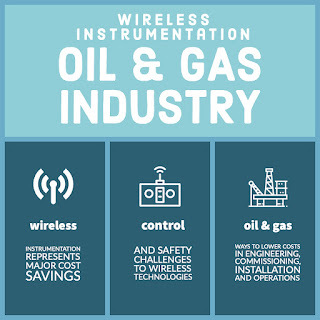 As the world’s oil giants are looking for new ways to improve costs in engineering, commissioning, installation and operations, wireless instrumentation represents major cost savings through elimination of local field cable, associated field-run cable trays and ease of maintenance. The production facilities are more often subject to changes which are expensive and wireless instrumentation provides flexibility to a larger degree compared to the traditional wired instruments during such upgrades. For offshore facilities, weight savings is also a preferred advantage introduced by wireless instrumentation. The main contributions to weight savings for wireless instrumentation also comes from the elimination of cabling, cable trays, junction boxes, I/O cabinets and so on. In Brownfield projects, the significance of cost savings and weight reduction by using wireless instrumentation is even higher. There are challenges to use wireless technologies for control and safety applications. For control applications, the requirement is to have a common timing domain for all components in the system. This means that the clocks of wireless sensors and actuators and the wireless gateway should be synchronized with the clocks of the controllers and control system. For most safety applications, continuous monitoring is necessary and a short response time needs to be guaranteed if a safety critical situation arises. Thus the primary difficulty in designing a wireless safety system is having a guaranteed short latency while not depleting the batteries. In addition, full control of all network message traffic is required, and loss of contact with a device must be identified immediately. WirelessHART enables wireless transmission of HART messages, and was the first standard to be released which specifically targets industrial applications. Wireless HART was approved as IEC standard 62591 in 2010. The standard WirelessHART Architecture is shown in Figure 1. The Wireless HART devices are devices with WirelessHART built in or an existing installed HART- enabled device with a WirelessHART adapter attached to it and Wireless Access points enable communication between these devices and host applications connected to a high-speed existing plant communications network. ISA100.11a standard compliant wireless devices demonstrated interoperability in the same network and communication performance of the multiple vendor devices are nearly the same. Both WirelessHART and ISA100.11a are based on the IEEE Std. 802.15.4 PHY and MAC, although the MAC has been modified to allow for frequency hopping. Furthermore, WirelessHART and ISA100.11a operates in the popular 2.4 GHz band, which allows for global availability. TDMA with frequency hopping is used as channel access method, and with a full mesh network topology, Wireless HART offers self-configuring and self- healing multi-hop communication. ISA100.11a wireless technology offers sufficient performance to provide a secure, stable and reliable network for non-critical monitoring and control applications deploying into actual field sites. ISA100.11a supports both routing and non-routing devices, so network topologies can be either star, star-mesh or full mesh depending on the configuration and capabilities of the devices in the network. An ISA100.11a network is able to carry multiple field bus protocols, such as Foundation Fieldbus, PROFIBUS and HART. There is also integrated support for IPv6 traffic and routing in the network layer. Both standards are designed to support scalability, low energy consumption, ability to work in legacy environments, security, and ability to function fully in environments where devices must coexist with our wireless devices and networks. The strict and limited approach of WirelessHART ensures that practically all WirelessHART devices will have identical behavior, regardless of design and implementation choices made by the equipment providers. The wide range of available optional and configurable parameters in ISA100.11a allows for great flexibility for adapting network behavior to various application requirements. WirelessHART is a wireless extension of the wired HART Field Communication Protocol Specification. The ISA100.11a application layer is object oriented, and implements tunneling features that allow devices to encapsulate foreign protocols and transport them through the network. Security is always a concern in any network, wireless networks are considered to present distinctive challenges. Because the wireless transmissions can travel for a considerable distance, it is important that the network be adequately secured against monitoring and intrusion. The WirelessHART standard mandates that networks employ a multilayered approach to network security. Both transmitter and receiver must authenticate with the network control system. Transmissions are encrypted using a 128-bit NIST-certified algorithm and verified for completeness and accuracy upon reception. Keys are managed by the gateway and rotated automatically. This combination of authentication, encryption, verification, and key management makes a wireless network as secure as a wired system. 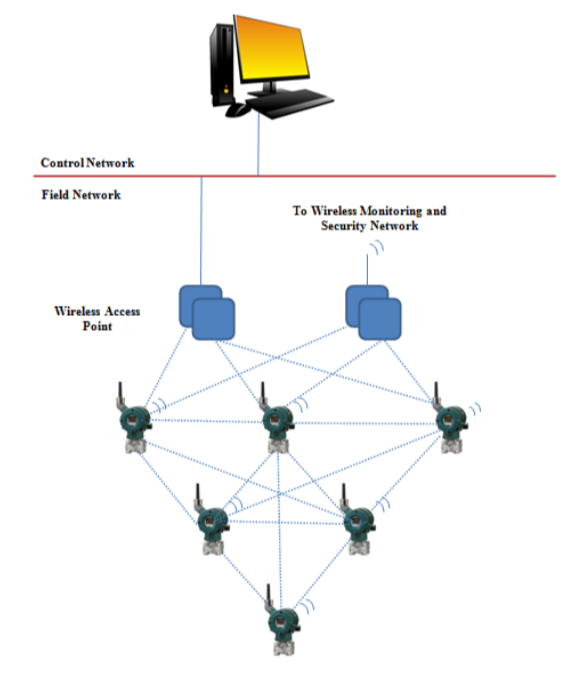 A wireless network requires none of the infrastructure improvements like cost of a measurement loop in the cable, conduit, and multiplexing hardware required to connect the sensor to the facility’s DCS (Distributed Control System), and the resultant savings are substantial. Perhaps the most attractive attribute of a wireless network is that installation cost is significantly reduced when compared with that of an equivalent wired system. A wireless network requires none of these infrastructure improvements, and the resultant savings is significant. In addition to delivering significant labor and material cost reductions, deploying wireless networks can be done much faster and with lower project management overhead. Once installed, wireless networks can be easily and inexpensively expanded to include additional measurements points for simply the cost of the transmitter. With an installed wireless network this investment can be further leveraged by providing wireless coverage in different parts of the facility. The wireless networks now a days only requires minimal maintenance as the advanced transmitters utilize Time Synchronized Mesh Protocol (TSMP) to carefully control the timing of each transmission. This enables each transmitter to keep its radio and processor powered down until it is time to send or receive a transmission due to which battery life typically lasts for several years. Wireless Instrumentation are self-organizing and eliminates site surveys. The primary concern of reliability with wireless networks is based on the assurance of data transmission from the field device to the WirelessHART gateway. The WirelessHART auto routing meshing capabilities are spontaneously managed and result in quick resumption of service in data transmission links in the event of a hindrance. This auto routing capability minimizes or eliminates data transmission interruption. Since data transmission is digital, the data measured or transmitted to the field device reflects values at the automation system. To ensure reliability, digital wireless protocols such as WirelessHART have inherent error checking functions to ensure signals don’t suffer from drift or spikes, any corrupt data is flagged and retransmission is requested, retransmission mechanisms to resend data if it becomes corrupt, reconstruction of partially scrambled data packets. Electronic Wave Interference is the greatest barrier for adoption of industrial wireless technology for automation in oil and gas industries. Process automation production facilities are constructed using a large amount of metal equipment such as tanks, boilers, pipes, and mounting apparatus. As a result, the facility itself is the main obstacle for wireless communication technology because metal materials readily reflect radio waves. Technologies such as Frequency-Hopping Spread-Spectrum (FHSS), Direct-Sequence Spread-Spectrum (DSSS) Technology or Orthogonal Frequency Division Multiplexing should be considered so that data signals travel through a radio frequency. Modern wireless networks offer a reliable upgrade path that even provides some surprising benefits when compared to traditional copper networks. With wireless technology, inherent mechanisms make use of redundant paths to route data. Wireless repeaters can be added to increase the reliability of a specific wireless network, and reliability can be further enhanced by the use of redundant gateways. Including WirelessHART as part of the core design of the field device network infrastructure creates inherent design flexibility, which can be used to increase reliability and reduce required maintenance. This allows network design to include the use of wired fieldbus and wireless networks depending on the specific application. Using wireless field devices and networks as an additional technology will enhance the overall robustness of the field device network architecture. It will also save time in terms of inspections, while eliminating potential for design error and reducing complexity. Fewer wires mean reduced design intervention in terms of routing and terminations, and faster repairs in the event of any incidents. Design for wireless instrumentation should start from the planning phase and before commissioning of the wireless network by performing the site engineering to ensure a good network design, considering communication distances, extent of obstructions, multipath environments. Conduct the network engineering such as layout planning, data publishing period, number of retries. Validate the network planning by measuring RSSIs and PERs at the pre-commissioning stage after deploying the devices. To ensure Wireless Instrumentation is stable and reliable, use a license-free and application-free radio spectrum throughout the world so that the wireless radios behave the same in different countries or regions; design field devices for low power consumption for small battery sizes and long battery life; Implement data encryption schemes, device authorization in networks and, certification of devices to address security concerns; include communication re-try functions and provide flexibility for network configurations for stability and reliability of communications, implement channel-hoping scheme and channel black/white listing capabilities for co- existence with or interference from other wireless radio applications sharing the 2.4GHz spectrum. To mitigate the effects of interference, wireless protocols may employ various coexistence mechanisms. In WirelessHART and ISA100.11a, clear channel assessment (CCA) and channel blacklisting are the weapons of choice to combat the degrading influence from other wireless networks. Oil and Gas industry may still retain wired instrumentation for implementing critical control and safety instrumented loops, and for processes requiring high speed communications. There are still concerns that high speed applications may not be suitable for wireless due to potential lags in communications, or asynchronous communications between wireless devices. The recommendations by experts are to use wireless where it is most appropriate to supplement and enhance the overall integrity of the I/O infrastructure such as wireless instruments are changing the scope of what is possible in process analytical measurement. Implementing wireless instrumentation in instances like offshore drilling or well head monitoring application will certainly save costs and provides safety in the risky and extreme offshore conditions. As experience with wireless technology grows, this attitude is shifting, with wireless becoming the default user selection for well-proven applications. Their low cost and ease of implementation make it practical to measure points that are prohibitively expensive to wire. The improvements in process awareness and redundant measurement allow oil and gas operators to tighten process control, increase performance and extend the time between maintenance shutdowns. In situations where speed-of-deployment and time-to-revenue are critical, wireless is by far the best alternative. New advanced wireless systems provide comprehensive solutions for implementing a modern self-organizing network. New development projects should plan with a wireless strategy in mind. Even though development projects traditionally rely on well proven technology, time has definitely come to offer wireless technology the attention it deserves in the planning process considering the cost benefits it offers for both green field and brownfield projects. Although at the planning stage all application areas or possibilities of wireless technology may not be obvious, designing the oil and gas facility with a strategy for wireless instrumentation and also preparing for a wireless infrastructure should be a part of the design specification. Citation: Smitha Gogineni, “Reliability of Wireless Instrumentation in Oil & Gas Industry.” Journal of Instrumentation Technology, vol. 3, no. 1 (2016): 1-3. doi: 10.12691/jit-3-1-1. 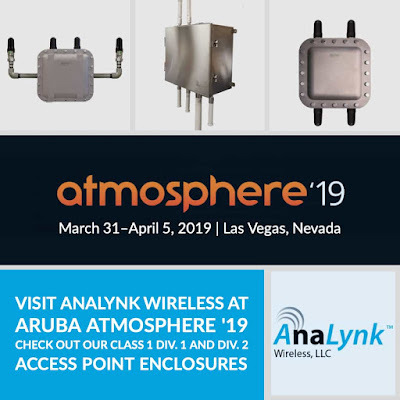 Atmosphere is the annual Aruba meeting and convention for innovators in the field of networking, security, IoT, mobility and the cloud. Atmosphere provides attendees an opportunity to meet and rub shoulders with over 3000 peers to learn, collaborate and influence the direction of Aruba products, all with the common goal to build the industry’s best enterprise-class technologies in wireless & wired infrastructure and software, security, location services, and analytics & assurance. For more information visit this page on the Analynk web site.